I discovered Pure Dog Talk on the long drive from Idaho to Arizona with our new mastiff puppy Junior and was absolutely hooked! It is a podcast dedicated to providing education and resources to pure bred dog owners in the areas of showing, preservation breeding, dog sports, and everything in between. Host, Laura Reeves, was kind enough to sit down with me for an interview and share her background and experience as a German Wirehaired Pointer breeder, a professional handler and her recent journey to podcast host extraordinaire. Big Dog Mom: How many years have you been breeding dogs? Showing Dogs? Laura Reeves: My family bred field trial labs starting in the late ‘70s. We then added Clumber Spaniels and German Wirehair Pointers in the early ‘80s. I stayed with the Wirehairs and continued, working with my mom for most of the time, but whelped my first litter on my own in 1996 after graduating college and working “IRL” for several years. Big Dog Mom: What breeds have you owned, bred or shown in the past? 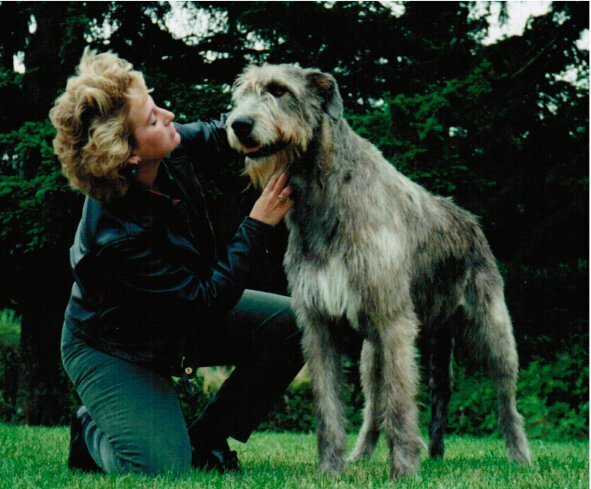 Laura Reeves: When I first started handling my entire client load was primarily Akitas, Irish Wolfhounds, Clumbers and German Wirehair Pointers. Over the years I’ve shown just about everything. I don’t do a lot of drop coated breeds, but I’ve finished dogs and won each of the 7 groups at one point or another. Big Dog Mom: Tell me about your goals as a breeder? Where would you like to see your breeding program in the next 5 – 10 years? Laura Reeves: My goal has always been to breed good looking, good working, happy, healthy family companions. I won’t breed a dog that doesn’t have at least the basic hunting instinct — and has proven it with titles, legs toward titles etc. I work on generally loose line breeding concept. After 20 years I stick to what I know works with regular outcrosses, mostly to Field dogs that I have watched run. I’ve attended every German Wirehair Pointer Club of America national since 1997 and have seen most of these dogs, and have a virtual pedigree in my head for all of them. Big Dog Mom: What would you say has been your greatest achievement(s) to date as it relates to your dogs? Laura Reeves: My puppy buyers keep coming back for their next dog! We’ve won lots of ribbons over the years, #1 ranked dogs, history making dogs (mom bred and I handled the breed’s first best in show winning dual champion, we bred one of two champion/VC (versatile champion in the North American Versatile Hunting Dog Association (NAVHDA testing system) and the first CH/MACH (Master Agility Champion) 5. 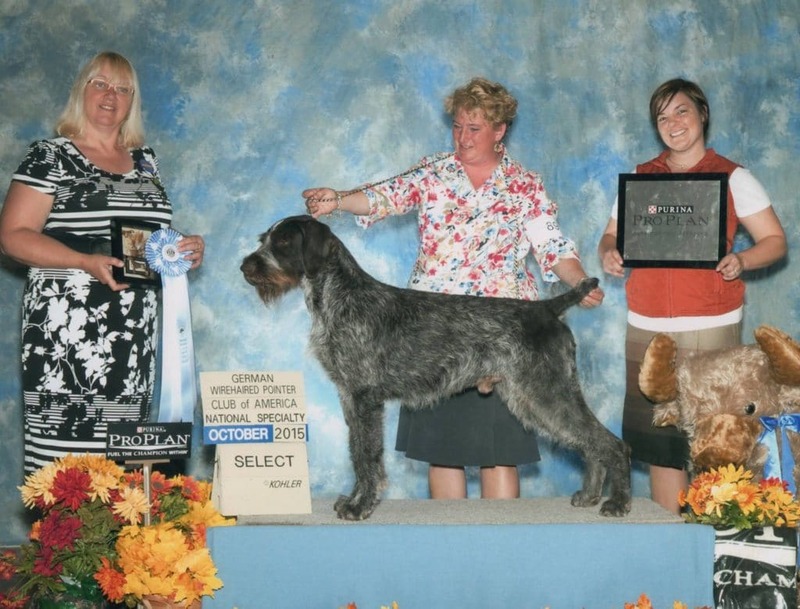 I bred and owned a ROMX (The Register of Merit Excellent is a second, higher level of recognition for top producers), a dual futurity winner (field/show), I’ve bred/owned/handled dogs to every award at the German Wirehaired Pointer Club of America (GWPCA) national *except* BISS (Best In Specialty Show). So that’s on the bucket list. I’m judging the futurity/maturity at this year’s national. I was on the Board of Directors for the GWPCA for 10 years, 4 as president. I’ve served on the Judges Education (JE) committee, written the AKC Gazette column, was National Events Coordinator and lots more. As a handler, I’ve been successful with top ranked and Best In Show (BIS) winning specials. I’ve specialized in sort of “difficult” dogs, so in many cases the “win” is simply that they make it around the ring without exploding. Big Dog Mom: Did you have a mentor when you started out? If so, who? Laura Reeves: LOTS of mentors —- In my breed, everyone from Pat Laurans & Doug Ljungren, to some of our foundation breeders like Mildred Revell and Genevieve Capstaff. In handling, Pat & Don Rogers, Brian Clegg, Tad & Bobbie Duncan, Ric and Nancy Byrd and LOTS more. I grew up in the sport and have had an amazing network of support over the years. Big Dog Mom: Can you tell me one or two things your mentor shared with you that made an impact on you as a breeder/dog owner/handler? Laura Reeves: Mildred Revell was where my emphasis on Wirehairs with correct coat started. She said, “I’m lazy! I don’t want to do a lot of grooming. So I breed dogs with correct coat.” She was right! I literally bawled like a baby all the way back to the hotel. It was the first time anyone had been NICE to me the entire week. Big Dog Mom: Did you, or how did you, come up with the initial concept for Pure Dog Talk? Laura Reeves: I did not! I had been working on various exhibitor education concepts, even have an outline for BIS University, but just had been meandering, basically, with no real direction. Mary Albee and I met by pure accident at a dog show in southern California last May. We started talking about mutual goals. This podcast was one of them. I kept telling her NO! I can’t do audio! I’ll write the content. She persisted and by December we were launched. Big Dog Mom: Tell me about the process of getting Pure Dog Talk from concept to launch. Laura Reeves: Literally, this is a woman show (with some rough edits from a male assistant). Mary has 30+ years in the film industry as a stunt person and coordinator, so she had the connections, technical savvy and resources to get it off the ground. Big Dog Mom: Do you have a mentor that is helping you get started in the world of podcasting? Who? How has he/she helped you? Laura Reeves: Mary has a tremendous network and a long career. She is absolutely the one who convinced me I could do this. She still does all the editing and technical stuff. I taught handling classes for many years. I have a degree in journalism, worked several years as a newspaper reporter. So interviewing is one of my skills. I also worked for a sound design company and wrote/produced audio driving tours back in the day. That was where I was able to learn how to “write for the ear” as my old client described it. Big Dog Mom: Who has been your favorite guest so far? Your favorite episode? The episode that has generated the biggest response? Laura Reeves: I can’t pick a favorite!!! It’s like picking a favorite kid – not possible. As our audience grows, each of the episodes gets higher and higher numbers of downloads, so it’s sort of unfair to say our first interviews (Legendary AKC Judge, Ginny Lyne for example) get higher response than our last one. Bill & Taffe, Janice Hayes and the series we did on whelping with Dr. Gayle Watkins and the one on stud dog management are definitely listener favorites. There are a few more coming up that I think people will LOVE! Click HERE for Pure Dog Talk Episode 1. Big Dog Mom: What are your goals with Pure Dog Talk – where would you like to see the show go in the next year, 5 years? Laura Reeves: We hope to have it sponsored and really take off by early next year. We have great support from the Dog Show Superintendents Association and our listeners. Having the show making a profit and continuing to serve a great need in the fancy would be my very happy place! Big Dog Mom: What do you enjoy doing when you are not busy with your dogs? Laura Reeves: You’re funny! This is a 24/7/365 gig but I love it! When I have a break, I head directly for the ocean. Laura Reeves: Crufts, riding Paso Fino horses on a cattle ranch in Argentina, riding the Outlaw Trail from Canada to Mexico on horseback. I don’t know about you, but I am always looking for information and resources that will help me be a better dog mom for my boy, Junior and Sulley. I listen to several podcasts that are dedicated to dogs and dog sports, several of which are listed on my Resources Page. Pure Dog Talk is one of these that I never miss an episode of! 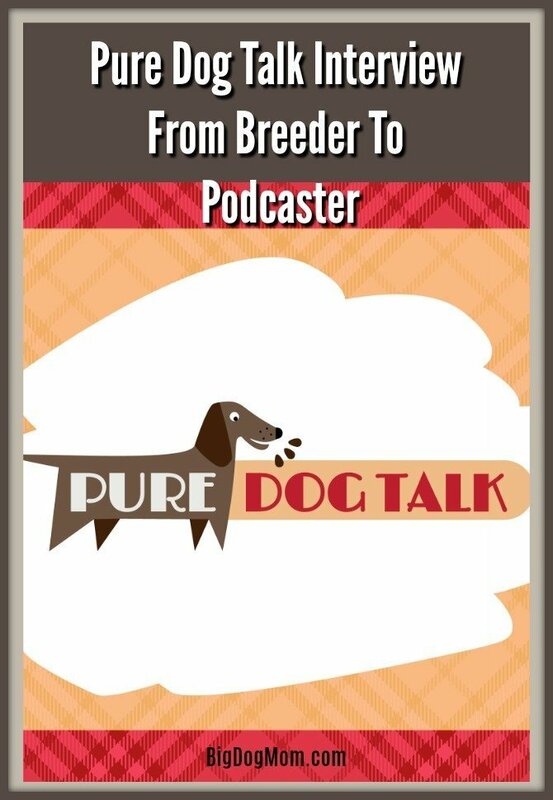 To learn more about this excellent podcast and listen to new and prior episodes, you can go to the Pure Dog Talk website. I would love to hear what you think about this interview. Do you have other dog-podcasts you enjoy listening to? I would love to know! Please feel free to post a comment below or email me at stephanie@bigdogmom.com. Previous Post: « Nose Work Is Not Just For Bloodhounds And German Shepherds.